Blanket your garden with Lamb's Ears. They are soft and fuzzy just for Ewe. These Lamb's Ears, about six inches tall, are just taking off in spring. Just a few weeks later, they are elongating in preparation for bloom. In this photo, they are about eighteen inches tall. Lamb's Ears is the perfect example of plant over planter (and we mean the person doing the planting not a cute little pot). So widely grown and cultivated that it seems to be a native of almost everywhere. Actually, it is native to Northern Turkey, the Southern Caucasus Mountain region and Southern Iran where it grows on rocky hills and scrub areas. In other words, it is a weed. Which is exactly the quality it makes apparent in a rational planned garden. Like many weeds we adopt, it does its own thing. This makes it important to use it the right way in your garden and not try to make it something it isn't. For instance, it isn't the border plant to end all border plants. The potted plants are so cute and they look so nice when you line the driveway with them, but this is a mistake. Why? Because they aren't going to stay there. Now don't get me wrong, I don't mean they are going to sneak off in the middle of the night or anything as clandestine as that. What they do is grow outward from the center and leave a nice bare spot in the middle. This usually starts happening after they finish blooming. While Lamb's Ears can take partial shade, they can't take excess water, which makes them a poor choice for planting near a lawn. So what are they good for? Pure pleasure. Let them be free and they will spread their seeds and grace the garden with their downy softness and tall graceful purple flower heads. Here a Lamb's Ear and there a Lamb's ear, almost everywhere there will be a Lamb's ear, and you will be glad you let them have their way. Oh, and some of you may wonder why an Herb Company grows Lamb's Ears. While there are a few folkloric references to herbal uses for Lamb's Ears, like to staunch wounds (thus the old name woundwort) and as a washcloth, it has a home here because of its association with the medicinal herb Betony. 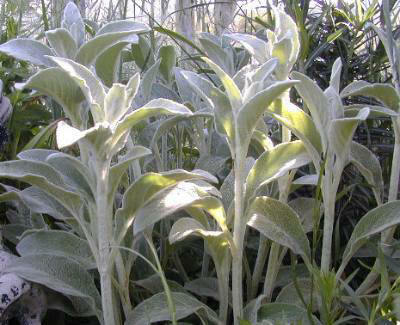 Both are in the genus Stachys and we tend to collect as many members of any herbal genus as possible. 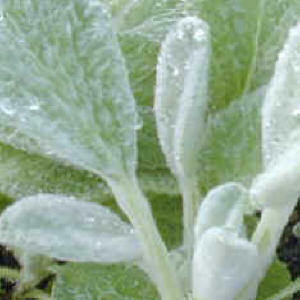 We don't always like all the different species, but Lamb's Ears found a permanent, yet variable, spot in our gardens. Just a note about the variety of Lamb's Ears that do not bloom; they are slow. We did trial these years ago in the hope that they would be a better border plant or perennial addition to the garden. But, we weren't too impressed. Our original clumps are still in the garden. Over 8 or 10 years they have gone from 6 inch mounds to eighteen inch mounds; a little too tame for us. All those perfect tips are just right for fresh Wreath Making. 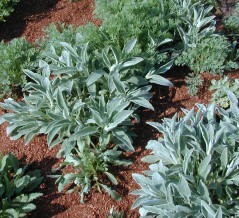 Lamb's Ears are included in our Kid's Herb Garden Six Pack and our Crafter's Herb Garden for Zones 5-11.